<< Back David Coulthard, Christian Klien & Vitantonio Liuzzi signed Red Bull Racing Photo REDUCED PRICE! David Coulthard, Christian Klien & Vitantonio Liuzzi signed Red Bull Racing Photo. 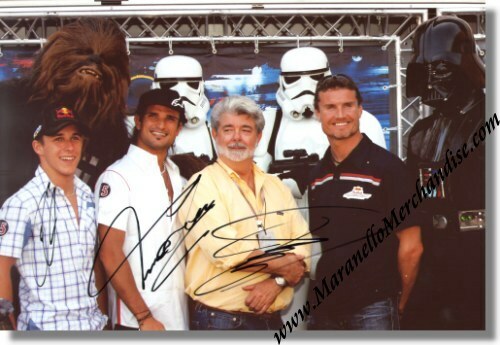 This is great and LARGE photo of David, Christian and Vitantonio posing with George Lucas, the "father" of Star Wars. All three drivers personally signed this photo with a black marker.